The Konica Auto S2 is a Japanese 35mm fixed-lens rangefinder camera that was produced in 1965 by Konishiroku Photo Industry Company. 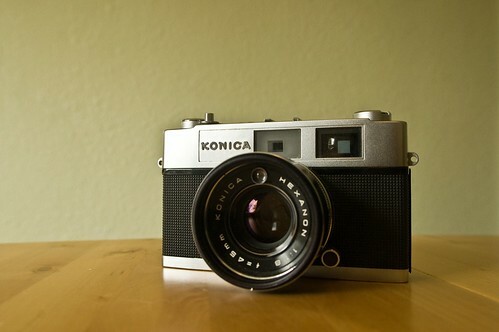 The camera differs from the earlier Konica Auto S by having a Hexanon 45mm f/1.8 lens and with its CdS meter cell re-located to the name ring in the front of the lens. This relocation of the sensor has a couple advantages. One is that the lens cap now covers the sensor as well, effectively turning off the metering system and preserving battery power. Another is that metering will be correct when a filter is fitted, since the sensor is now located behind the filter as well. Like it's predecessor, an optional pull-out hood accessory was available for flare reduction. There is one variant of this model, called the the Auto S2 "New" or the Auto S2 "EL" in different markets. These are actually the same variant, designated by a small round silver label on the right, front of the camera. The difference is an improved film take-up spool, that makes film loading easier. "EL" is short for "Easy Load". The "Auto S2" on top of the camera is in a script font and is sometimes misread as "Auto 52" by persons unfamiliar with the designation. There is no "Konica Auto 52" model. 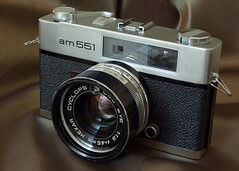 Another variant, perhaps, the camera was also marketed by Montgomery Wards department stores and catalog sales in the U.S., as the Wards am551 is the "New/EL" variant. These use a lens labelled "Hexar" and "Cyclops". 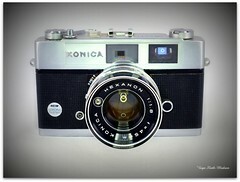 But likely the lens is no different from the Hexanon fitted to the Konica cameras, just branded differently. The camera also was offered in Europe by Foto-Quelle re-branded as the Revue Auto S2 and Revue Auto S22 the latter being the "New/EL" variant. Film: 35 millimeter film in safety cartridge.